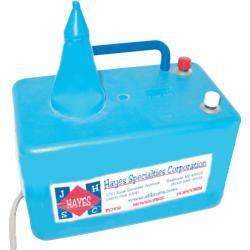 Main Category: Rentals LOCAL PICKUP ONLY | Type: Equipment | Hayes Specialties Corp. The apple hacker is great for fundraisers, festivals or any variety of events it will piece large quantities of apples with ease. Just add caramel, nuts, and whipped cream for a treat that is hard to resist. 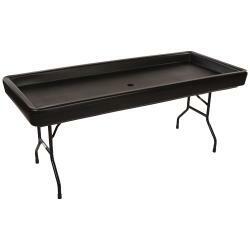 Includes base and handle, must be returned within 24 hrs. from time of pickup. Late charges and cleanup charges will be assessed when returned. Need to make a balloon arch or fill balloons to fall at midnight on New Years? This is the perfect rental for you, it will inflate the balloons in a fraction of the time it would take to do it manually. Balloons WILL NOT float Must be returned within 24 hrs. from the time of pickup. 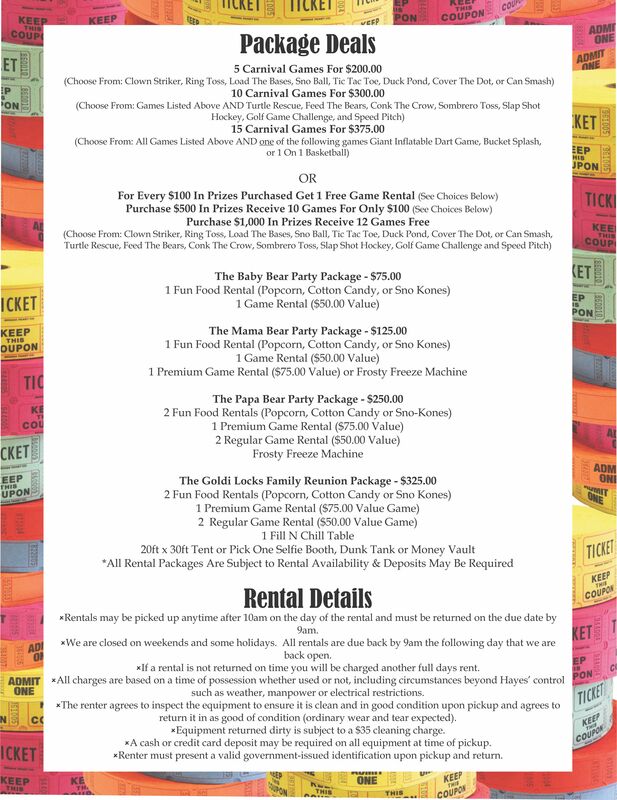 Sweeten up your event with a rental cotton candy machine, they are perfect for so many different events fundraisers, parties, family reunions. Must be returned within 24 hrs. from time of pickup. Late charges and cleanup charges will be assessed when returned. Make sure your event has cold beverages at the push of a cup. 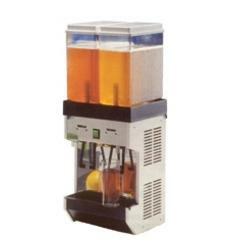 This drink dispenser holds approximately 1 &frac14 gallon per side and cools the beverage. 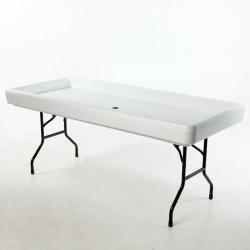 Must be returned within 24 hrs from time of pickup, excluding Sundays. 2 INCH BALL HITCH AND VALID MICHIGAN DL# REQUIRED. 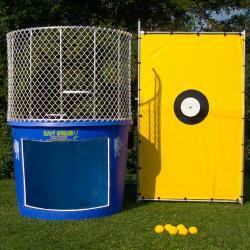 The Easy Dunker has been delighting crowds for years and has been a leading money maker at fairs, carnivals, fundraisers, etc. It is trailer-mounted for easy transportation and sets up in 2 minutes with no tools. Must be returned within 24 hrs from time of pickup. Late charges and cleanup charges will be assessed when returned. 800 GALLON CAPACITY. The tarp dimensions are 88 inches tall by 55 inches wide. Keep your food and beverages cold and fresh. 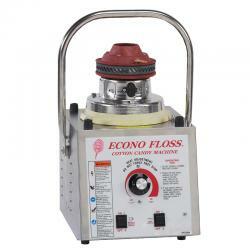 It as a tapered bottom and features a two stage drain system. Use indoors or out. It has a weight capacity of 500 pounds including 100 pounds of ice. Inside dimensions are 29 x 69 x 3.5 inches and an outside dimension of 31 x 73 x 6.5 inches. Must be returned within 24 hrs from time of pickup. Late charges and cleanup charges will be assessed when returned. 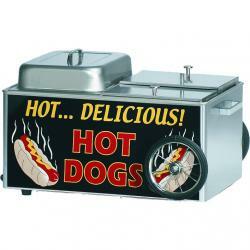 Hot Dogs are a great addition to any event and this Hot Dog Cart Steamer is perfect for preparing large quantities of dogs. The cart holds approximately 30-40 hot dogs and 30 buns. Must be returned within 24 hrs. from time of pickup. Late charges and cleanup charges will be assessed when returned. 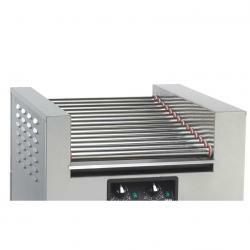 Hot Dogs are a great addition to any event and this Hot Dog Roller allows for a large quantity to be prepared at the same time. The roller fits approximately 45-50 hot dogs at a time. Must be returned within 24 hrs. from time of pickup. Late charges and cleanup charges will be assessed when returned. Machine Style May Vary. 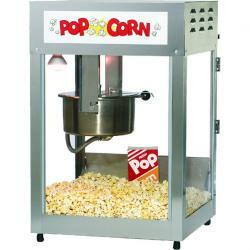 Just about everyone loves popcorn and with this easy to use machine you can have popcorn at any of your events. 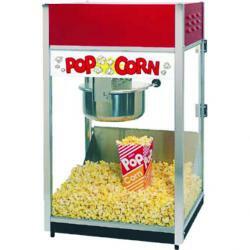 Use 6 oz Naks Paks for an even easier time popping corn with delicious consistent resutls. Must be returned within 24 hrs. from time of pickup. Late charges and cleanup charges will be assessed when returned. Machine Style May Vary. 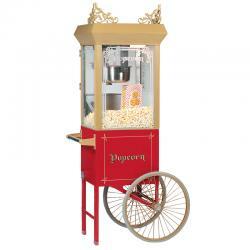 Just about everyone loves popcorn and with this easy to use machine you can have popcorn at any of your events. 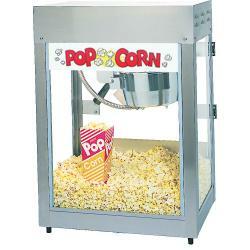 Use 6 oz Naks Paks for an even easier time popping corn with delicious consistent resutls. Must be returned within 24 hrs. from time of pickup. Late charges and cleanup charges will be assess when returned. Machine &amp Cart Style May Vary. 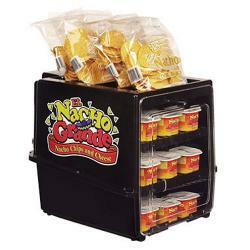 Ideal for portion pretzels or nachos. Must be returned within 24 hrs. from time of pickup. Late charges and cleanup charges will be assessed when returned. 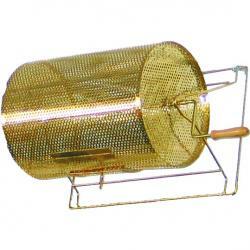 This raffle drum measures approximately15 x 19.7 x 17.5 inches and holds approximately 10,000 tickets. Must be returned within 24 hrs. from time of pickup. Late charges and cleanup charges will be assessed when returned.